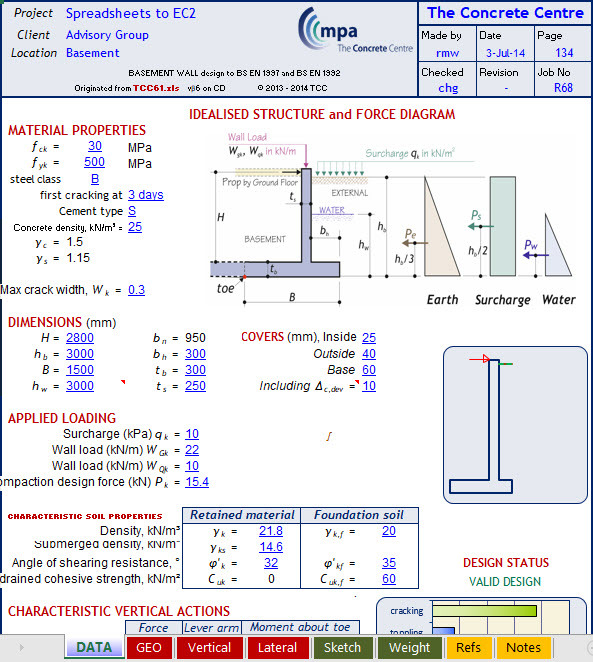 This Excel sheet to design Concrete Basement Wall details strength design (durability and other considerations not included) for a new buried concrete basement wall in a single-story masonry building. The example follows the provisions of ACI 318-11, Building Code Requirements for Structural Concrete. Throughout the example, discussion of the “in practice” decisions/situations the designer may encounter are included. Additionally, at the conclusion of the problem some “what-ifs” are evaluated. ACI Committee E702, “Designing Concrete Structures Committee,” is part of the ACI Educational Committee structure. Their mission is to develop educational programs and instructional materials within the area of design. The committee has developed various design examples to illustrate the use of various ACI documents. 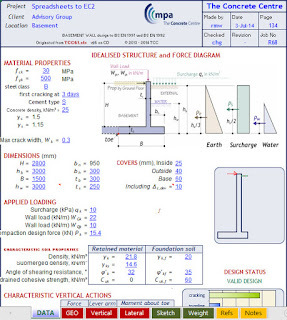 These examples provide step-by-step calculations with references to applicable code provisions for common member design problems, and may also include calculations for common concrete testing procedures, field data analysis, or evaluations.